Craft beer on tap–to go! For centuries, every sizable town had its own brewery. The beers were rich and varied, limited only by the brewmasters’ imagination. However, in the days before bottles or cans, sampling a brewery’s beer meant going there in person. Today, the craft brewing industry is more exciting than ever. And now Growler Grlz brings the breweries to you. Cheers! Better than a bar – We're Bringing New Brew to You. What if you took a road trip to Hawaii to check out a new brewery, but when you got there, it kinda left you flat. Growler Grlz Growler Filling Station brings the breweries to you, from across the state, the country and beyond. Sample the latest beer here first before you commit: have a taste, a flight or a pint and see what hits your sweet spot (our helpful staff can guide you). Then fill up a reusable growler so you can enjoy more later. 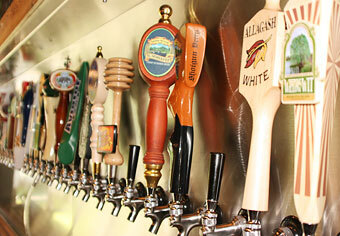 Fresh craft beer on tap, in volume, and at refreshing prices. Eye-popping selections of all your favorite beer styles – and others you deserve to know better. The freedom to drink fresh craft beer on your terms: where, when and with whom you want. Need ideas? Picnics, parties,tailgates, barbecues, bonfires, inside, outside and in any kind of weather. All beers available in 16oz pints, generous 20oz pints, as part of a "tasting flight," and in both a 32oz growler and a 64oz growler. Prices posted at Growler Grlz. Have a suggestion for a beer? Like Growler Grlz on Facebook and let us know! Before cases, cans and bottles, the only way to drink beer at home was by hauling it in a pail, jug or jar. In the old days, your local pub would top off your bucket, slap a lid on it and send you on your way. During the journey home, sloshing beer would creep out from under the lid. The escaping CO2 made a "growling" sound and a name was born! Well, maybe. Another theory holds that customers and barkeeps would “growl” at each other over the level of beer in the bucket. Either way, at Growler Grlz, you won’t find any leaky tin buckets or stingy barkeeps. Our growlers are stylish and secure, waiting to be filled (to the top) with fresh, delicious, local and hard-to-find beers. Beer, variety, convenience & beer. Granted, you may be willing to drive four hours just to taste the hottest new brewery’s seasonal selection, but now you won’t have to. Choose from FORTY TWO (42!) taps of beers across all styles–from varied local favorites to more distant options, for you to take home in either a 32-oz or 64-oz growler. Get your hands (and lips) on beer that isn’t bottled or canned, or even available outside the brewery itself. Forget St. Patrick’s Day. At Growler Grlz, “green beer” takes on a whole new meaning. Our containers are reusable, recyclable, sustainable and earth-friendly. The full-service filling station is back. We won’t wash your windshield or check your oil, but we will top off your tank. 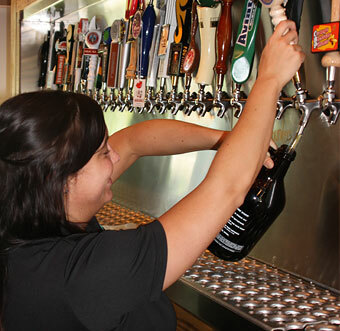 Bring in your clean, empty growler or choose one on site – either way, you’ll go home all fueled up. You may like beer. You may even LOVE beer. But how well do you understand beer? Our employees are beer enthusiasts, and well-versed in the different styles and the featured breweries, so ask for guidance and don’t be intimidated. We’re out to help you understand beer better, because the more you know, the more you'll appreciate great beer. 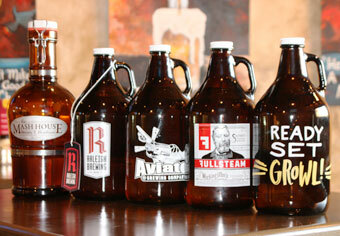 Different sizes and styles let you choose a growler according to your thirst level and venue: going tailgating? If you can’t take glass, might we recommend something in a stainless steel? Don’t need a full half-gallon? Opt for a more compact 32-ounce growler. Our “field research” takes us far and wide, and our on-site visits with brewmasters and breweries fill us with knowledge (among other things) that we can pass on to you. We do the hard work so you can enjoy fresh, famous, notable and obscure beers from a single source. Growler Grlz is currently interviewing those who will proudly represent the Growler Grlz brand with a positive, high-energy attitude and who will help the team to provide an exceptional craft beer experience to our guests—and that means every guest, every time. All applications will be reviewed by the management team. We will contact viable candidates to schedule in-person interviews. NO PHONE CALLS PLEASE. We promise to provide an inspired work environment with exciting potential for career advancement. Thank you for your time and interest in Growler Grlz. We look forward to hearing from you! Upcoming Eventz at Growler Grlz. Technically, every day is an event, since we swap out taps so frequently. Occasionally, though, there’s something extra special going on. Check this page for details. Looks like all our upcoming events consist of tapping fresh, new and hard-to-find beers. Check back soon for specific goings-on. What the heck is a growler? 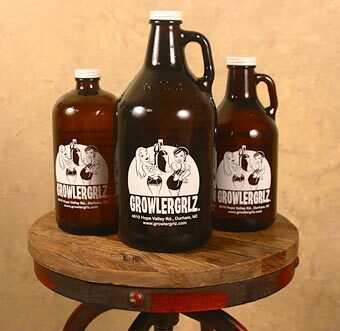 Regardless of how it became known as a growler, all you need to know is that it’s a 32- or 64-ounce sealed, reusable container for you to get your favorite beer from one place (Growler Grlz) to another (your call). Buy it once and refill it over and over again. A full, unopened growler will stay fresh for 7-10 weeks, but after that first pour, it’s best enjoyed within 24-48 hours. Each Growler Grlz tap represents a relationship with a brewery, and we’re forging new ones all the time. We aim to satisfy beer fanatics’ need for easy access to a variety of unique beers at more affordable prices than you’ll find at the pub. The more you visit, the more you’ll discover. Growler Grlz is an advocate for safe and legal consumption, and will neither serve nor sell to anyone under the age of 21. Do not open any growler or consume any alcohol while in a vehicle, moving or otherwise. Defer your enjoyment until you are home or in an approved location for alcohol consumption—the best things come to those who wait.